(W/A) Various (CA) Stephanie Hans. In one of the most magical realms on Battleworld, Angela and Sera are Witch Hunters -- the scourges of King James' England, just as it stood in 1602. But their target now is a new breed of evil: the power-bargaining Faustians! The Faustians have made their deal not with the Devil, but with the ever-seductive Enchantress -- and that may be just as deadly. Have your psychic ribbons and lethal weapons at the ready, for the hunt is on! But beware a land where the dead walk, the faerie folk flutter and a ragtag band of ne'er-do-wells perform for your entertainment -- that's right, it's the Guardians of the Galaxy, 17th-century style! Plus: Revisit the early dawn of the Marvel Universe in the first issue of Neil Gaiman's original classic 1602! 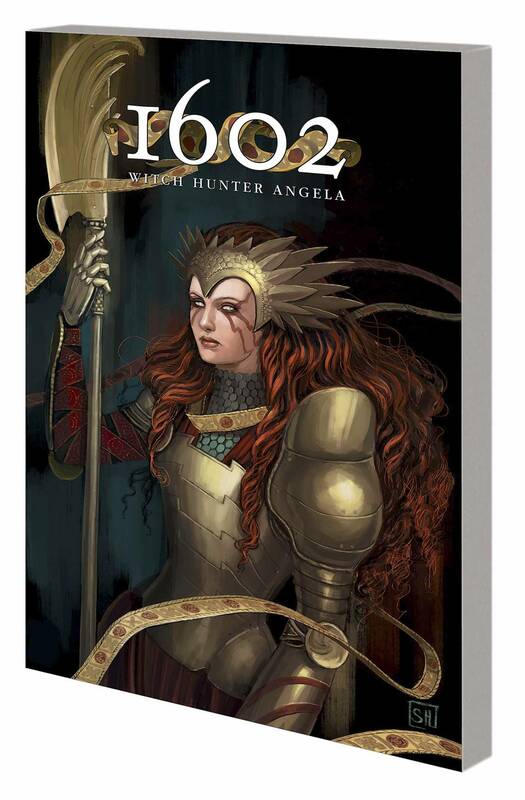 Collecting 1602 WITCH HUNTER ANGELA #1-4 and 1602 #1. Rated T+.